Team India, Australia, and England are my favorite teams who can lift the world cup 2019. Those who are saying West Indies as a favorite, well West Indies holds the position four. However Pakistan comes after that, I mean to say, Pakistan can even lose their match against Afghanistan due to poor selection and favoritism by board officials. 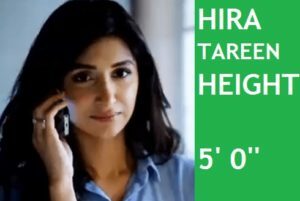 No batsman other than Babar Azam has a technical batting style, all others are just like hitters who stay on pitch to smash every ball recklessly, however batting today has become one of the technical and scientific approaches. Why India, Australia, England and West Indies are Favorites for this Tournament? You will agree with me as reality is clear as a water, India is favorite for ICC 2019 Cricket World Cup because Virat Kohli is technical player who knows the art of finding gaps, keeping Run rate under control and plays wrist shots at any stage of the game, Rohit and Dhawan have produced successful opening partnerships every time, Mr. Reliable MS Dohni who lead Chennai Super Kings in the best way and played a key role here to stay right on top of the table throughout the IPL. Australia can change the game if David Warner and Steve Smith and Shane Watson are included in a Squad? You might be wondering about this but believe me both players have a lot of potential and they have been out of the International Cricket for many years so there are fewer chances to take their wickets because they have been practicing hard these years, results can easily be seen in IPL matches where both have performed amazingly, if they are included in World Cup Squad, Australia can again surprise oppositions to win again another World Cup. Shane Watson has contributed a major role in PSL to win most of the matches against pace blowing attack of Pakistan so it is highly recommended that if he is chosen for this World Cup, there will be a different scenario. Is England favorite to Lift the World Cup 2019? 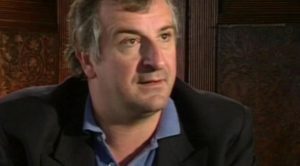 Yes indeed, if there is any team who can surprise all big nations including South Africa, Australia, West Indies, and India, it’s England who scored 481 runs highest in the history of the One Day Internationals against rival Australia and they have a very strong team line-up, perhaps the most favorite squad that you will see. Jonny Bairstow, Joe Root, Eoin Morgan, Sam Curran will crush the opposition at any stage. Why did I include the West Indies rather than South Africa? First of all, let me tell you the main story behind, West Indies have many players playing in IPL for different matches and their practice in IPL is improving day by day, just watch Chris Gayle, Andre Russell, Pollard, Braithwaite, DJ Bravo and Dareen Sammy in IPL and PSL respectively had played superbly and changed the whole game alone so the confidence level is quite high. This time teams have not been divided into groups like A, B, C, D as previously done, it is 1992’s World Cup format where all teams are included in one Round-Robin table, Top 10 teams are playing for this World Cup, Afghanistan successfully ended the Qualifiers round along with West Indies right on top of the table to compete for 9th and 10th position in the table. They beat all other qualifiers like Ireland, UAE, Hong Kong, Nepal, Zimbabwe, Netherlands, and Kenya. 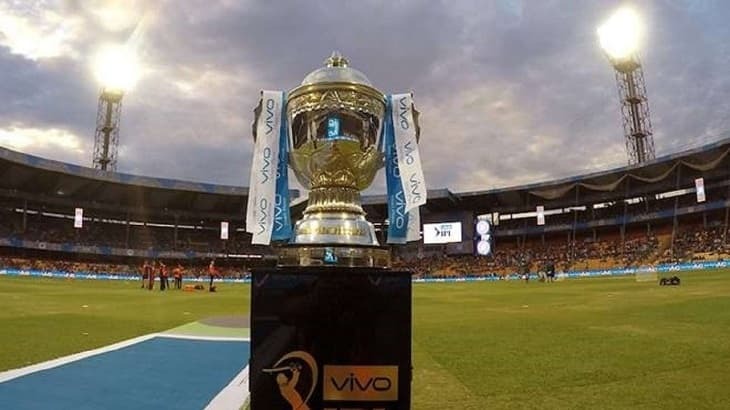 Soon after VIVO IPL 2019, ICC World Cup will start from 30 May 2019, this is why Indian Squad and other International players would have less time for rest but on the other side, they would be fully prepared after playing so many matches in IPL. This can be positive for Team India and negative as well. New Schedule has already been announced, a total of 48 matches will be played consisting of two Semi-Finals and one Final which will be played at Lords Cricket Ground. The first match will be played between Host England and South Africa on 30 May 2019. This time ICC has changed the pattern and there is no grouping this time. Round-robin approach is used where all teams are categorized in one table only where each team will play with other nine national teams on different locations. Since this world cup is hosted by England and Wales so all matches will be directly broadcasted through different channels, you can enjoy your favorite streaming channel links on this website too, it would be updated once the World Cup will start. Download your all matches by clicking on this image, it contains all details of your favorite matches. 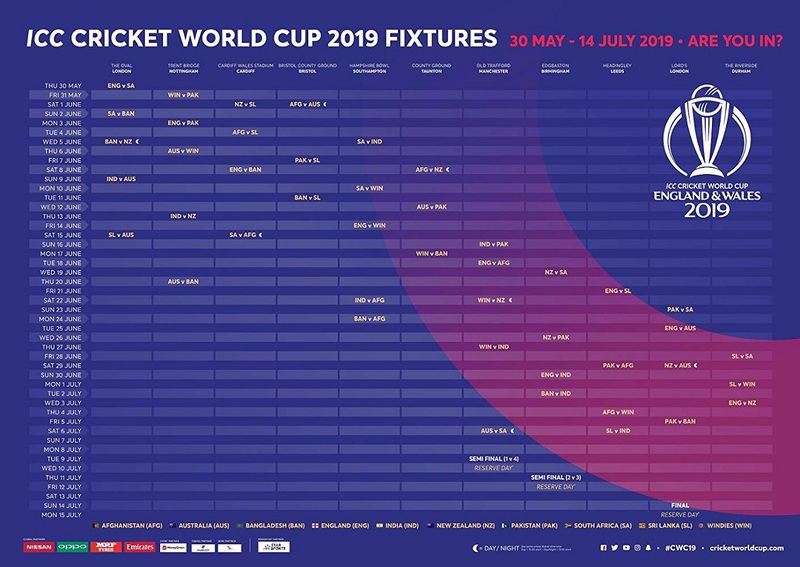 If you are looking for ICC World Cup 2019 Fixture, just go through it right now. 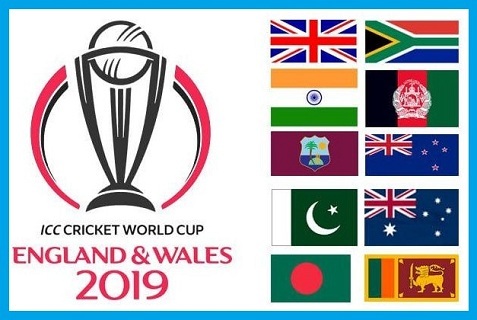 We all know that ICC cricket World Cup 2019 is knocking at our doors and wait is just going to over in a blink of an eye, you would be glad to know that there are 48 matches in total including two semi-finals and one big final. Enjoy this ultimate power of magic and select your favorite match list stated below, You can simply search your favorite Team by clicking on a search button. England and Wales withdrew their hosting from ICC Cricket World 2015 and India and Sri Lanka hosted that World, so transfer rights were automatically shifted to England and Wales for next world which is 2019 ICC Cricket World Cup where all matches will be played within England and Wales. ECB and ICC have selected 11 grounds within the locality and these are arranged according to the situations, those grounds were capacity is low, they have low attractive competing nations like Pakistan and Afghanistan because the overseas audience in England for both countries are low. There were almost 8 teams who already qualified for the ICC Cricket World Cup 2019 and the 9th and 10th position was vacant for the qualifiers, West Indies and Afghanistan qualified beating UAE, Zimbabwe, Kenya, Ireland, and others and took their place on number 9 and 10 respectively. Now qualifying round has been finished and all teams have been arranged in one ground since it is a round-robin pattern so there is no chance to make grouping this time. 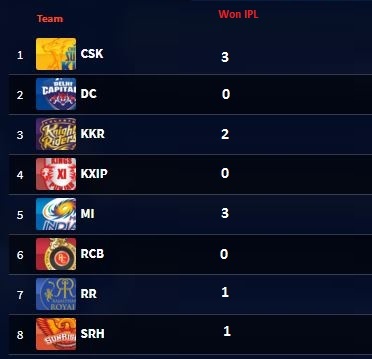 Each team has almost every bit of chance to show the talent and take top four positions because top 4 will qualify for the Semi-Finals and then it would be a Final at Lords. Names of these teams are stated as under. Tell us more about your favorite team and don’t forget to share the link with your friend. Team India is my favorite and hopes Blues will do magic this time. 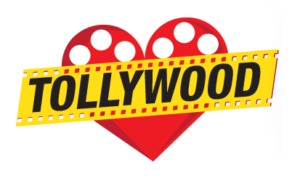 Enjoy watching your favorite teams playing this World Cup 2019 on these websites, you can also search on starsofworld.com to enjoy live streaming channel totally free, stay connected with us.